Niagara Falls Hotels Ontario Canada – There are many places to stay in Niagara Falls and you do not have to break the bank to do so. An excellent way to know if it is a good choice is to see what previous visitors have to say about their visit. 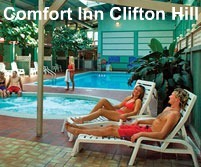 Comfort Inn Clifton Hill is really a wonderful choice. One Block to the Falls! Free Breakast! Free WIFI Internet! Free Indoor Pool Access! What more can you ask for from the 2009 Traveler' Choice award winner according to former visitors according to their comments at TripAdvisor. And it also is very reasonable even though it is located right in the heart of the Niagara Falls tourist entertainment district.